USA’s Jason Brown performs his short program at the 2016 Team Challenge Cup. 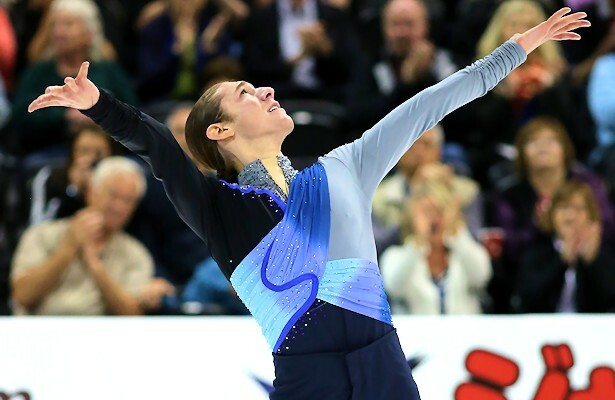 When USA’s Jason Brown arrived at the Spokane Arena for practices for the Team Challenge Cup last month, he headed to the spot where he entered the rink for his last competition here, the 2010 U.S. Figure Skating Championships. “Whenever you’re back somewhere, it’s that perfect benchmark to see how far you’ve come,” said the 21-year-old. Back in 2010, he brought the crowd to its feet after a strong performance to “Pax de Deux” from The Nutcracker score during the junior men’s free skate to win the title. Several months later, he was sent to the Gardena Spring Trophy, for what would be the first of many international competitions. Six years later, Brown again received a standing ovation at the end of his free skate to “Scent of Love” and “Big My Secret” from The Piano soundtrack. He received the second highest score among all the men to help Team North America win the inaugural team competition. The Team Challenge Cup felt like a new beginning for the skater who was sidelined for the majority of the 2015-2016 season due to a back injury. Brown and his team had hoped to make that splash earlier, at the 2016 World Figure Skating Championships in Boston. Kori Ade, his longtime coach, had petitioned for the 2015 Skate America bronze medalist to be included on the team. That did not happen. Brown still watched the competition from home and came away impressed with many of his competitors. Meanwhile, Brown, who trains in Monument, Colo., put all his effort in recovery and preparing for the Team Challenge Cup. He was fervent about his physical therapy; setting up his appointments a month in advance and following his recovery plan with great precision. The 2015 U.S. National champion was back on the ice in early February. He started skating programs approximately six weeks before Team Challenge Cup and was doing clean run-throughs by the week before the competition. He supplemented that training with off-ice cardio, namely cycling, to build endurance. Ade said a positive side effect in Brown’s recovery was the strength he built during physical therapy. In Spokane, Brown skated to a new short program to “Apassionata” by Secret Garden. The program, which will be carried over into the next season, was originally choreographed for the 2016 U.S. Figure Skating Championships. Brown’s former short program, a Great Gatsby-style program to “Love is Blindness,” had lots of quick movements that were putting stress on his back. Choreographer Rohene Ward worked on a new program that would be more manageable. Brown withdrew from the competition, but the program stuck. Brown will keep The Piano free skate for next season, but will be sporting a new costume. In Spokane, he wore a button-down black shirt and pants, a simpler look in comparison with what he wore in earlier competitions. The move was partially practical: The former costume no longer fit when Brown’s body physically changed during physical therapy. The two-time world junior medalist also admitted that he “wasn’t thrilled” with his former costume, and saw the Team Challenge Cup as an opportunity to try something new. Brown said he plans to push for something similar for next season. There’s more than a new costume that Brown and Ade want for his free skate: A quadruple jump. Having both programs for next season—typically he would still be working on new programs during this time of year—will also help, Brown said. “That’s going to be huge for me and huge with the development of the quad because I can really train for the jump,” he said. Brown said he feels some pressure when he sees his competitors attempt and land multiple quads while he is still trying to get one in competition. However, he is more focused on his own goals with the jump—to land one in the short program and two in the free skate—and in general. Indeed, Ade said she doesn’t want adding the quads to adversely affect Brown’s strengths, including his ability to connect to the audience. “It’s just going to be about how much we would have to compromise artistically in order to integrate two quads, ” she said. Brown was landing the quadruple toe loop in practice prior to the injury. Since his recovery, he’s been training both the toe loop and the Salchow, both with and without a pole harness. Overall, they are both satisfied with where Brown is with the jump. “I’ve made a lot of progress with the quad and I’m beginning to integrate (them) back into my training plan,” Brown said. After several weeks of training after the Team Challenge Cup, Brown is now on vacation. He recently left for a trip to Israel through Birthright Israel, a program which organizes trips for youth of Jewish descent. Afterwards, he will head to Rome to visit his best friend, who is studying abroad there. “It’s the first time I’ve been out of North America without my skates,” he joked. When he returns, the skater, who trains in Monument, Colo., will have a busy summer of training and competition when he returns early next month. As in past years, Brown plans to compete at the Broadmoor Open in Colorado Springs, Colo., which will be held 22-25 June. It’s not yet known if he will compete at the Skate Great Aerial Figure Skating Challenge, a jumping contest that will take place during that competition. Brown will also compete at the Glacier Falls Summer Classic in Anaheim, Calif. in July. “I really like to keep (most of) July open for training and not be so competition heavy,” Ade said. During that month, Brown will also travel to Sun Valley, Idaho, to co-headline the opening show (with reigning U.S. silver medalist Polina Edmunds) of the Sun Valley on Ice series. In the fall, Ade hopes Brown can secure entry in a few early senior international competitions as well as two events in the Grand Prix of Figure Skating season. Brown is looking forward to a full season of competition. Outside of competition, Brown has continued to take classes at the University of Colorado-Colorado Springs, where he is studying communications. “I’ve always loved the balance of school and skating,” he said. Brown is currently exploring a number of career fields, including public speaking and sports broadcasting. He also would like to spend a year teaching English in Japan. The skater has continued to work with a Japanese tutor, who helped him write several messages to Japanese fans, such as the one he wrote explaining his withdrawal from NHK Trophy last fall. He generally writes shorter messages, such as ones for posts on Twitter or Instagram, himself. While he was recovering from his injury, Brown said he had more time to work on his language skills. “I would say, like in school, I’m like in first grade in reading and writing, but a first grader can speak way better Japanese than me,” he quipped.